Product #5539 | SKU A95UF | 0.0 (no ratings yet) Thanks for your rating! 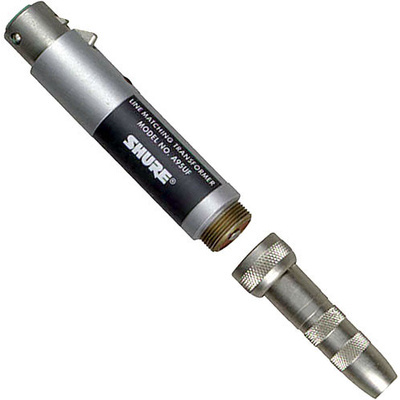 The Shure a 95UF Transformer provides 24 dB of voltage gain and may be used in reverse (high- to low- impedance). It has a professionally balanced 3-pin XLR female low-impedance connector. An Amphenol MC1M-type output connector with mating 1/4" female phone jack complete the transformer. The transformer permits use of very long microphone cables with either low- or high-impedance microphones. The transformer prevents high-frequency loss, level loss, and pickup of noise and hum. The A95UF is furnished with a three-socket professional audio connector on the low-impedance end for mating with the Canon XL Series, Switchcraft A3 or equivalent.